I've got an application where it'd be handy to cluster a noisy dataset before looking for subgroup effects within the clusters. I first looked at PCA, but it takes ~30 components to get to 90% of the variability, so clustering on just a couple of PC's will throw away a lot of information. I then tried t-SNE (for the first time), which gives me an odd shape in two dimensions that is very amenable to clustering via k-means. What's more, running a random forest on the data with the cluster assignment as the outcome shows that the clusters have a fairly sensible interpretation given the context of the problem, in terms of the variables that make up the raw data. But if I'm going to report on these clusters, how do I describe them? 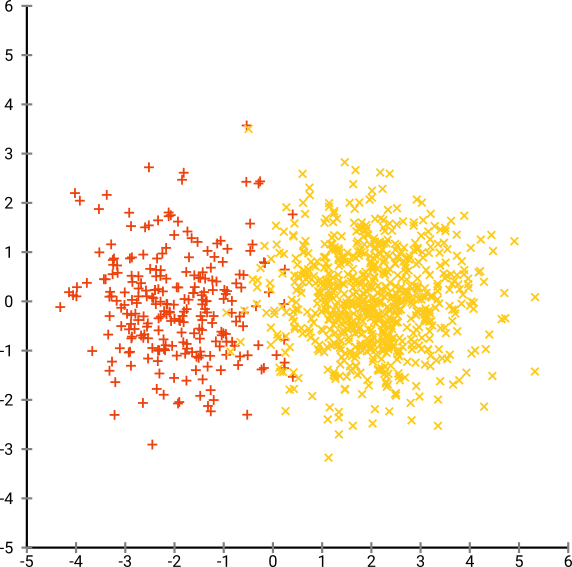 K-means clusters on principal components reveal individuals who are nearby to one another in terms of the derived variables that comprise X% of the variance in the dataset. 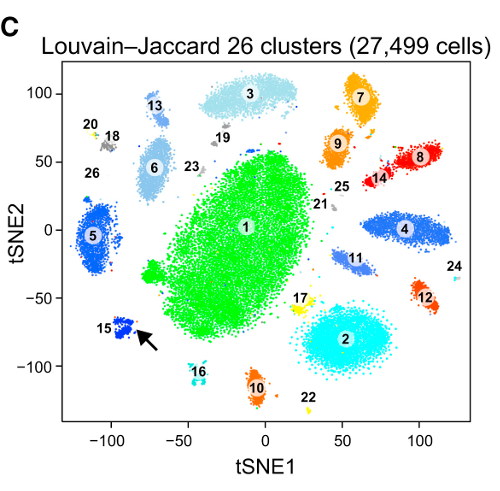 What equivalent statement can be made about t-SNE clusters? Can anyone propose a better blurb than that? The problem with t-SNE is that it does not preserve distances nor density. It only to some extent preserves nearest-neighbors. The difference is subtle, but affects any density- or distance based algorithm. To see this effect, simply generate a multivariate Gaussian distribution. If you visualize this, you will have a ball that is dense and gets much less dense outwards, with some outliers that can be really far away. Now run t-SNE on this data. You will usually get a circle of rather uniform density. If you use a low perplexity, it may even have some odd patterns in there. But you cannot really tell apart outliers anymore. Now lets make things more complicated. Let's use 250 points in a normal distribution at (-2,0), and 750 points in a normal distribution at (+2,0). Not bad, but also not that easy to cluster, is it? You will have a hard time finding a clustering algorithm that works here exactly as desired. And even if you would ask humans to cluster this data, most likely they will find much more than 2 clusters here. This will cluster e.g. with DBSCAN, but it will yield four clusters. 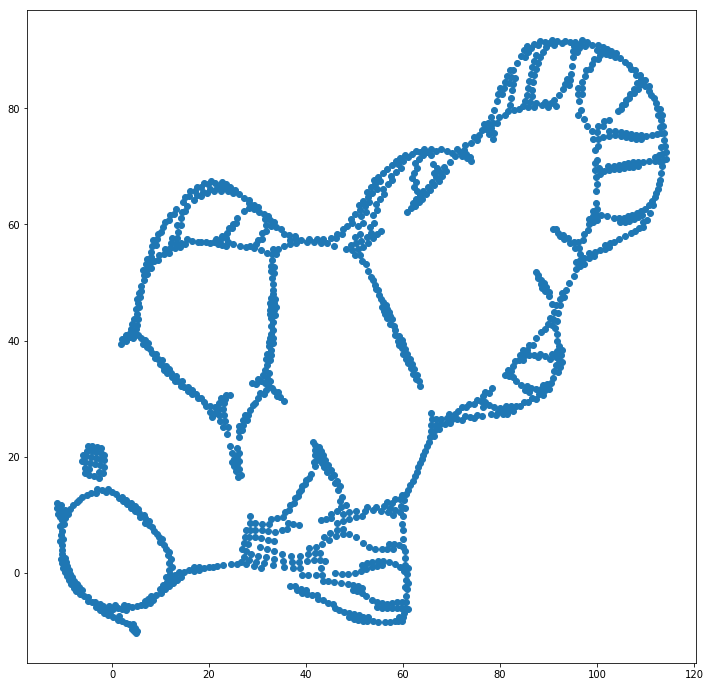 So beware, t-SNE can produce "fake" patterns! The optimum perplexity appears to be somewhere around 80 for this data set; but I don't think this parameter should work for every other data set. Now this is visually pleasing, but not better for analysis. A human annotator could likely select a cut and get a decent result; k-means however will fail even in this very very easy scenario! You can already see that density information is lost, all data seems to live in area of almost the same density. If we would instead further increase the perplexity, the uniformity would increase, and the separation would reduce again. In conclusions, use t-SNE for visualization (and try different parameters to get something visually pleasing! ), but rather do not run clustering afterwards, in particular do not use distance- or density based algorithms, as this information was intentionally (!) lost. Neighborhood-graph based approaches may be fine, but then you don't need to first run t-SNE beforehand, just use the neighbors immediately (because t-SNE tries to keep this nn-graph largely intact). Erich Schubert, and Michael Gertz. Intrinsic t-Stochastic Neighbor Embedding for Visualization and Outlier Detection – A Remedy Against the Curse of Dimensionality? As you may guess, this is derived from a "color me" image for kids. Wow, our fish has become quite a sea monster! Because the kernel size is chosen locally, we lose much of the density information. I have actually tried two implementations (the ELKI, and the sklearn implementations), and both produced such a result. 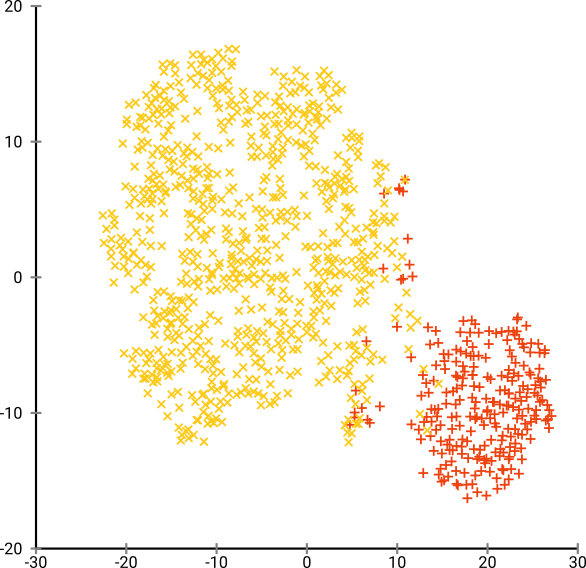 Some disconnected fragments, but that each look somewhat consistent with the original data. SGD relies on an iterative refinement procedure, and may get stuck in local optima. In particular, this makes it hard for the algorithm to "flip" a part of the data that it has mirrored, as this would require moving points through others that are supposed to be separate. So if some parts of the fish are mirrored, and other parts are not mirrored, it may be unable to fix this. 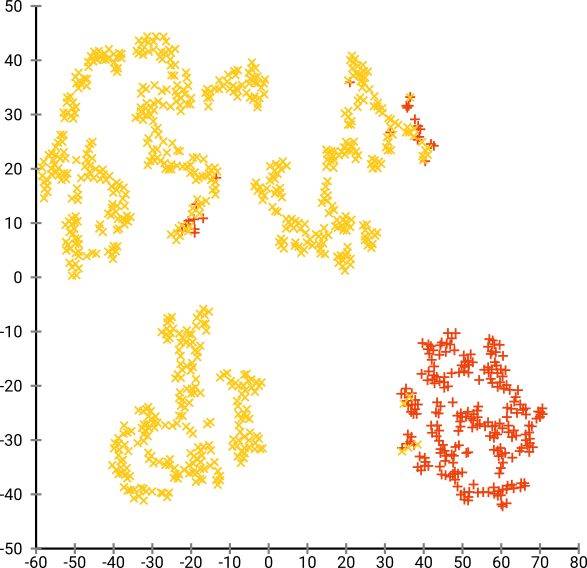 t-SNE uses the t-distribution in the projected space. In contrast to the Gaussian distribution used by regular SNE, this means most points will repel each other, because they have 0 affinity in the input domain (Gaussian gets zero quickly), but >0 affinity in the output domain. 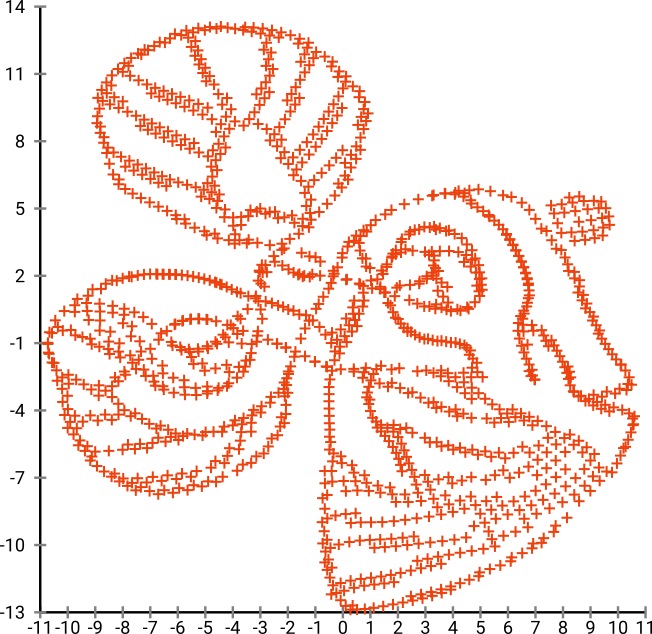 Sometimes (as in MNIST) this makes nicer visualization. In particular, it can help "splitting" a data set a bit more than in the input domain. This additional repulsion also often causes points to more evenly use the area, which can also be desirable. 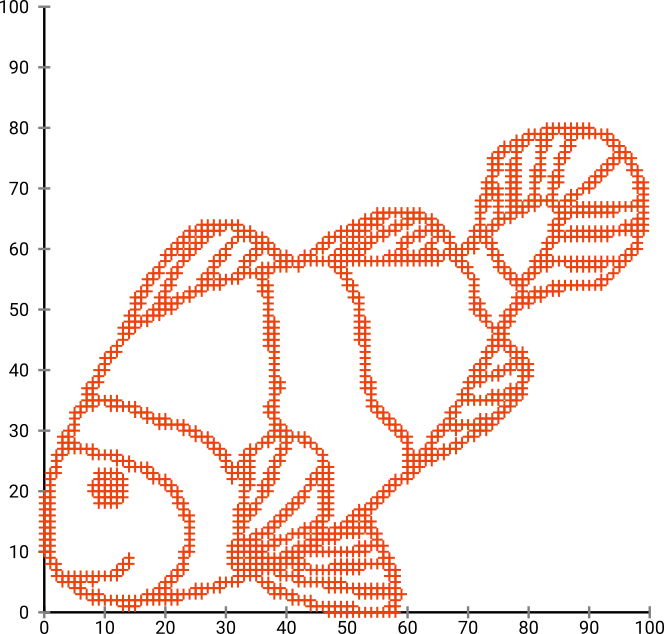 But here in this example, the repelling effects actually cause fragments of the fish to separate. 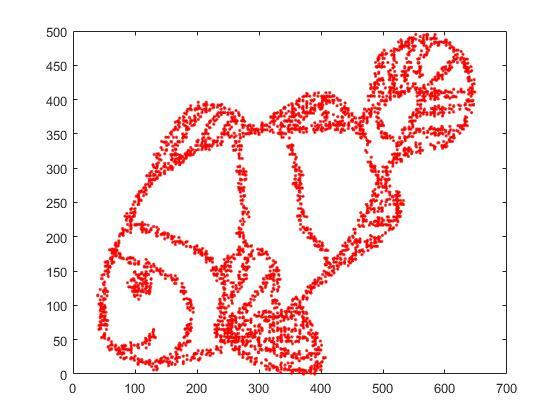 As you can see, even with "perfect" initial placement, t-SNE will "break" the fish in a number of places that were originally connected because the Student-t repulsion in the output domain is stronger than the Gaussian affinity in the input space. As you can see, t-SNE (and SNE, too!) are interesting visualization techniques, but they need to be handled carefully. I would rather not apply k-means on the result! because the result will be heavily distorted, and neither distances nor density are preserved well. Instead, rather use it for visualization. I would like to provide a somewhat dissenting opinion to the well argued (+1) and highly upvoted answer by @ErichSchubert. Erich does not recommend clustering on the t-SNE output, and shows some toy examples where it can be misleading. His suggestion is to apply clustering to the original data instead. use t-SNE for visualization (and try different parameters to get something visually pleasing! ), but rather do not run clustering afterwards, in particular do not use distance- or density based algorithms, as this information was intentionally (!) lost. I am well aware of the ways in which t-SNE output may be misleading (see https://distill.pub/2016/misread-tsne/) and I agree that it can produce weird results in some situations. But let us consider some real high-dimensional data. Take MNIST data: 70000 single-digit images. We know that there are 10 classes in the data. These classes appear well-separated to a human observer. However, clustering MNIST data into 10 clusters is a very difficult problem. I am not aware of any clustering algorithm that would correctly cluster the data into 10 clusters; more importantly, I am not aware of any clustering heuristic that would indicate that there are 10 (not more and not less) clusters in the data. I am certain that most common approaches would not be able to indicate that. 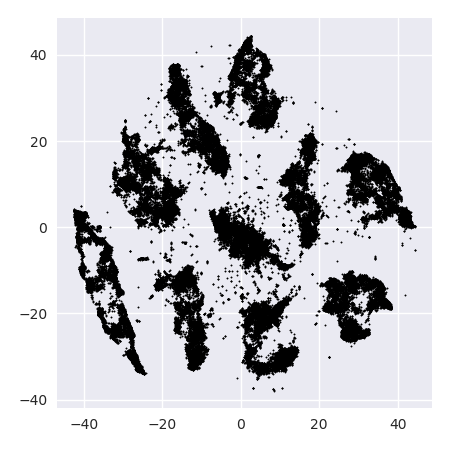 I would argue that the unlabeled t-SNE representation does suggest 10 clusters. Applying a good density based clustering algorithm such as HDBSCAN with carefully selected parameters will allow to cluster these 2D data into 10 clusters. Now it should be very obvious that there are 10 clusters. I encourage everybody who thinks clustering after t-SNE is a bad idea to show a clustering algorithm that would achieve comparably good result. And now even more real data. The reason it looks so pleasing is that t-SNE produces clearly distinct clusters and clustering algorithm yields exactly the same clusters. Nice. 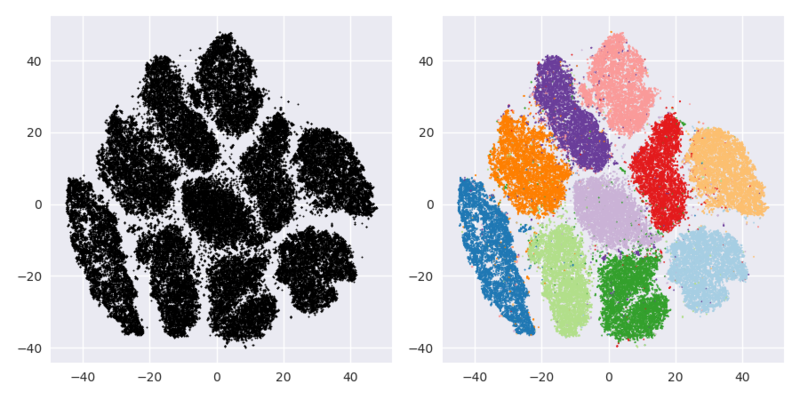 So what do you believe: the output of your favourite clustering algorithm together with your favourite heuristic for identifying the number of clusters, or what you see on the t-SNE plot? To be honest, despite all the shortcomings of t-SNE, I tend to believe t-SNE more. Or in any case, I don't see why I should believe it less. I think with large perplexity t-SNE can reconstruct the global topology, as indicated in https://distill.pub/2016/misread-tsne/. 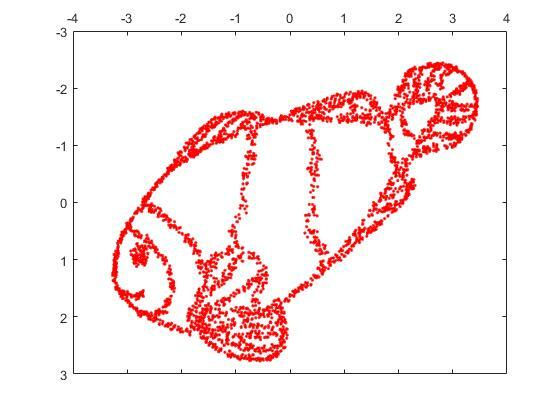 From the fish image, I sampled 4000 points for t-SNE. With a large perplexity (2000), the fish image was virtually reconstructed. Here is the image reconstructed by t-SNE with perplexity = 2000. Based on the mathematical evidence which we have, this method could technically preserve distances! why do you all ignore this feature! t-SNE is converting the high-dimensional Euclidean distances between samples into conditional probabilities which represent similarities. I have tried t-SNE with more than 11,000 samples (in genomics context) in parallel with different consensus clustering algorithms including Spectral clustering, Affinity and importantly with GMM clustering (which is a density based clustering algorithm!). As a result, I found very a good concordant result between two approaches (t-SNE vs. consensus clustering algorithms). I believe integrating t-SNE with consensus clustering algorithms could provide the best evidence of existing local and global structures of data. 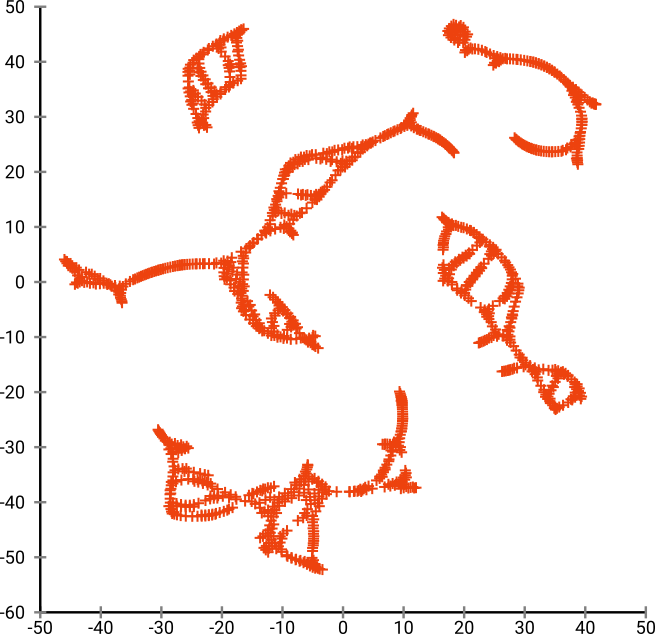 You could try the DBSCAN clustering algorithm. Also, the perplexty of tsne should be about the same size as the smallest expected cluster. Personally, I have experienced this once, but not with t-SNE or PCA. My original data is in 15-dimensional space. Using UMAP to reduce it to 2D and 3D embeddings, I got 2 perfectly and visually seperable clusters on both 2D and 3D plots. Too good to be true. But when I "looked" at the orginal data from the persistence diagram, I realized that there are much more "significant" clusters, not just 2. You can confirm the presence of these clusters in the original data using other methods, like persistence diagrams. Counting only the number of connected components can be done in a quite reasonable amount of time. Not the answer you're looking for? Browse other questions tagged clustering interpretation k-means tsne or ask your own question. Does it make sense to run DBSCAN on the output from t-SNE? How to tell if data is “clustered” enough for clustering algorithms to produce meaningful results? How to interpret t-SNE plot? Using tsne results to train a model? 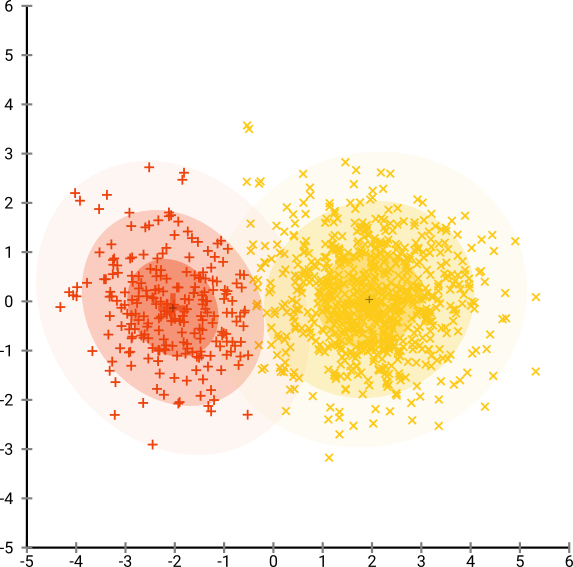 Does clustering need scalar data?